It’s time to get voting to crown Kent’s finest falconer as this year’s Tourism Superstar for England. It is the first time a Kent figure has been shortlisted for the national awards, and Visit Kent wants to see this local tourism hero fly away with the prize during English Tourism Week. Organised by VisitEngland in association with The Daily Mirror Travel as part of English Tourism Week, Tourism Superstar recognises the dedication of those working in the tourism industry, and is awarded to an individual who goes above and beyond the call of duty to ensure visitors have an unforgettable experience. Voting is open until 28th February, and the winner will be announced at the start of national English Tourism Week on Saturday 14th March. Mark was nominated for the award by Visit Kent and Leeds Castle for his “desire to impart knowledge and his dedication to the job”, and was shortlisted for the final along with nine other ‘tourism superstars’ from around the country. 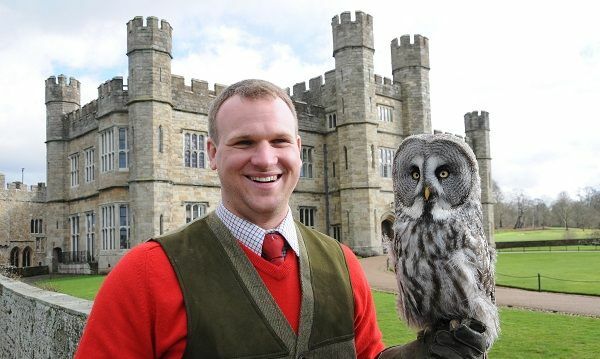 Since arriving at Leeds Castle three years ago, Mark has built up a collection of more than 20 birds, covering 16 different species of owl, falcon, eagle, hawk and even a Kookaburra. As Head Falconer, he is responsible for the care, training and flying of the birds, and educates and entertains children and adults alike with colourful information and free-flying display demonstrations. Bill Lash, Chief Executive for Leeds Castle said: “We are very proud that our Head Falconer is the first candidate ever to be selected from Kent for this award, and we hope our visitors will vote for Mark and support Kent tourism. Visit www.mirror.co.uk/tourismsuperstar to view Mark’s award entry, and to register your vote. Voting closes on 28th February, and the winner will be announced on March 14th, the first day of English Tourism Week.